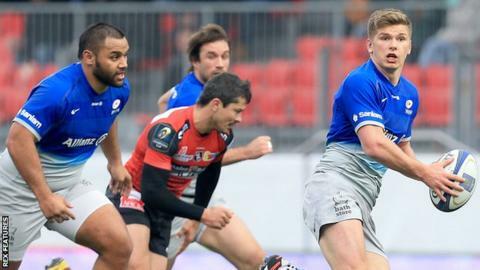 Saracens ran in six tries to thrash Oyonnax and take control of their European Champions Cup group. A penalty try and scores from Alex Goode and Chris Wyles gave Sarries a 24-3 lead at half-time. The bonus point was wrapped up four minutes after the break as Maro Itoje crossed, shortly before Richard Wigglesworth touched down. Arthur Aziza went over for Oyonnax but Schalk Brits was awarded a late effort to complete the rout for Saracens. Aziza's try was a deserved consolation for the French side, who were committed and spirited in their first ever home game in the Champions Cup, but were outclassed by a Saracens team that sits nine points clear at the top of Pool One. The Premiership leaders dominated the scrum, until the introduction of a series of replacements in the second half upset their rhythm, and attacked with speed and purpose to signal their credentials as title candidates. Who laid a claim for an England call? New England head coach Eddie Jones will name his first squad next month, and there were plenty of performances from Saracens' English contingent that would have caught the attention of the Australian. But it was Farrell who stood out with creativity and quickness that belied his reputation as a defensive, pragmatic fly-half. The England number 10 crashed through a gap in the Oyonnax rearguard before swinging a looping pass out wide to Wyles, who slipped in Goode for the visitors' second try. And Farrell was central to the next score, popping up an offload from the ground to allow Will Fraser to find the on-rushing Wyles on his way to touching down under the posts. In fact, it may be 26-year-old Fraser who gave Jones the most to think about after this display. The uncapped open-side flanker was impressive with the ball in hand and could provide competition for the England number seven shirt, particularly with the future of England captain Chris Robshaw under scrutiny. Saracens can take a step closer to progressing when they host Oyonnax in the reverse fixture next weekend. Saracens full-back Alex Goode said: "We are really coming alive when we get the ball in good positions at the moment. "We are using our strike runners very well. We are getting them in the game and we are picking them out. "Guys like Chris Ashton are doing brilliantly in terms of the support lines they are running. "We have had a young team over the last few years and we have grown together and added layers to our game. "We have been close in this tournament before, we have our foundations, we are in a good place but we know there is a long journey ahead yet." Oyonnax: Etienne; Tian, Bousses, Taufa, Codjo; Clegg, Cibray; Tonga'uiha, Maurouard, Pungea; Power, Fabbri; Ursache, Missoup, Wannenburg. Replacements: Lespinas for Clegg (51), Aziza for Cibray (51), M. Clerc for Pungea (53), Guillamon for Fabbri (63), Faure for Wannenburg (60). Not Used: Bordes, Rapant, Gunther. Saracens: Goode; Ashton, Bosch, Barritt, Wyles; Farrell, Wigglesworth; M. Vunipola, George, Figallo; J. Hamilton, Itoje; Rhodes, Fraser, B. Vunipola. Replacements: Ellery for Wyles (55), Hodgson for Farrell (59), Gill for M. Vunipola (52), Brits for George (52), Du Plessis for Figallo (50), Brown for Itoje (63). Not Used: Wray, De Kock.